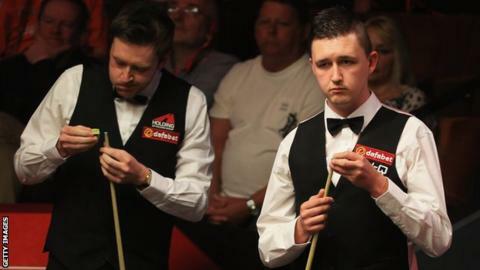 Kyren Wilson said he loved everything about his World Championship debut and is convinced he will be a success at the Crucible in years to come. Wilson, the world number 89, lost to Ricky Walden in a gruelling 10-7 match. The 22-year-old Kettering potter was edged out in a 73-minute final frame by the world number 10. Wilson is one of four Crucible debutants at this year's World Championship. Chinese player Xiao Guodong lost 10-8 to Ali Carter but Michael Wasley (pictured) pulled off a thrilling 10-9 win over world number two Dung Junhui. Robbie Williams starts his first-round match against Neil Robertson on Wednesday afternoon. "I have loved every minute of it; the attention, the crowd and the buzz all my family and friends have got. I can't wait to get back here," Wilson said. "It's not as daunting as it looks on TV. I was so nervous and scared coming in. But I settled really well and I think I will do well in the future." Wilson was an animated figure throughout a topsy-turvy game, playing to the crowd and clearly enjoying the attention. He led 3-1 and then trailed 6-3 and 8-4 and, despite a brave fightback that saw him close to within 8-7, lost by three frames. Wilson, who is in his first season back on the tour after a two-year absence, said that he might even have paid the price for enjoying himself too much. "It was an up-and-down game all through," he added. "I started off well and got 3-1 up but I think I was too relaxed in the first session and didn't expect it and Ricky punished me for that. "In the second session I got myself really up for it and was really nervous which was a nice feeling because I think that's when I play my better stuff. I was proud of myself and glad I made a game of it." But he has no intention of cutting out the fun factor. "It's a show," Wilson added. "People pay good money to come and watch us play so I want to put on a show and entertain people. "If that means me making a fool of myself then so be it. I enjoyed myself. It was my debut and hopefully I will be here a lot more."